This article is about the musician and actress. For her self-titled album, see Reba McEntire (album). Reba Nell McEntire (born March 28, 1955) is an American country music singer, songwriter, actress and record producer. She began her career in the music industry as a high school student singing in the Kiowa High School band, on local radio shows with her siblings, and at rodeos. While a sophomore in college, she performed the National Anthem at the National Rodeo in Oklahoma City and caught the attention of country artist Red Steagall who brought her to Nashville, Tennessee. She signed a contract with Mercury Records a year later in 1975. She released her first solo album in 1977 and released five additional studio albums under the label until 1983. Her father and grandfather, John Wesley McEntire (February 19, 1897 – February 13, 1976), were both champion steer ropers and her father was a World Champion Steer Roper three times (1957, 1958, and 1961). John McEntire was the son of Clark Stephen McEntire (September 10, 1855 – August 15, 1935) and Helen Florida McEntire (née Brown; May 19, 1868 – May 16, 1947). Her mother had once wanted to be a country-music artist but eventually decided to become a schoolteacher, but she did teach her children how to sing. Reba reportedly taught herself how to play the guitar. On car rides home from their father's rodeo shows, the McEntire siblings learned songs and harmonies from their mother, eventually forming a vocal group called the "Singing McEntires" with her brother, Pake, and her younger sister Susie (her older sister Alice did not participate). Reba played guitar in the group and wrote all the songs. The group sang at rodeos and recorded "The Ballad of John McEntire" together. Released on the indie label Boss, the song pressed one thousand copies. In December 1992, McEntire's seventeenth studio album, It's Your Call, was released. It became her first album to peak within the Billboard 200 Top 10, reaching No. 8. McEntire commented that the record was a "second chapter" to For My Broken Heart, while music reviewers such as Alanna Nash of Entertainment Weekly disagreed, writing, "In truth, it isn't nearly as pessimistic as its predecessor—and unfortunately it isn't anywhere as involving." Nash called the album's title track—which peaked at No. 5 on the Billboard Hot Country Singles & Tracks chart—"one of those moment-of-truth sagas at which McEntire excels. In the song, a wife answers the phone to find her husband's girlfriend on the other end and seizes the opportunity not only to inform her mate that she knows of his affair but to give him the ultimatum of choosing between the two. She's not the only one who's waitin' on the line, she sings, handing her husband the phone. It's your call." Christopher John Farley of Time magazine wrote that the album ranged from being "relaxing" to "cathartic", and "these vocals from one of the best country singers linger in the mind". The album's preceding singles—"The Heart Won't Lie" (a duet with then-labelmate Vince Gill) and "Take It Back"—were Top 10 hits on the Billboard country chart, reaching No. 1 and No. 5 respectively. Like its preceding album, It's Your Call sold over a million copies, eventually certifying by the RIAA in sales of double-platinum. Her eighteenth studio release was 1994's Read My Mind. The album spawned five major hit singles onto the Billboard Country chart, including the No. 1 single "The Heart Is a Lonely Hunter". The further releases ("Till You Love Me", "Why Haven't I Heard from You", and "And Still") became Top 10 singles on the same chart, with "Till You Love Me" also reaching No. 78 on the Billboard Hot 100, a chart that she had not previously entered. The album itself reached No. 2 on both the Billboard 200 and Top Country Albums charts. Charlotte Dillon of Allmusic gave the album four out of five stars, calling it "another wonderful offering of songs performed by the gifted country singer Reba McEntire". Dillon also felt that the album's material had "a little soul, a little swing, and some pop, too". Entertainment Weekly's Alanna Nash also gave the album positive feedback, viewing the album to have "enough boiling rhythms and brooding melodies to reflect the anger and disillusionment of the middle class in the '90s", calling the track "She Thinks His Name Was John" to be the best example of that idea. The song was eventually spawned as a single and was considered controversial for its storyline, which described a woman who contracts AIDS from a one-night stand. Because of its subject, the song garnered less of a response from radio and peaked at No. 15. Read My Mind became another major seller for McEntire and her label, selling three million copies by 1995 and certifying at 3× Multi-Platinum from the RIAA. After many years of releasing studio albums of newly recorded material, McEntire's nineteenth studio album, Starting Over (1995) was collection of her favorite songs originally recorded by others from the 1950s through the early 1980s. The album was made to commemorate twenty years in the music industry, but many music critics gave it a less positive response than her previous release. Allmusic's Stephen Thomas Erlewine commented that although the album was considered a "rebirth" for McEntire, he thought that some tracks were recorded for merely "nothing more than entertainment". The album paid tribute to many of McEntire's favorite artists and included cover versions of "Talking In Your Sleep" originally sung by Crystal Gayle, "Please Come to Boston", "I Won't Mention It Again" sung by Ray Price, "Starting Over Again", cowritten by Donna Summer and originally a hit for Dolly Parton, "On My Own", and "By the Time I Get to Phoenix". "On My Own" featured guest vocals from Davis, as well as Martina McBride and Trisha Yearwood. Despite negative reviews, Starting Over was certified Platinum by the Recording Industry Association of America within the first two months of its release, but only one single—a cover of Lee Greenwood's "Ring on Her Finger, Time on Her Hands"—was a Top 10 hit single. In 1997, McEntire headlined a tour with Brooks & Dunn that led to the recording of "If You See Him/If You See Her" with the duo the following year. This song was included on McEntire's If You See Him album and Brooks & Dunn's If You See Her album, both of which released on June 2. Thom Owens of AllMusic reported in its review that both album titles were named nearly the same as "a way to draw attention for both parties, since they were no longer new guns—they were veterans in danger of losing ground to younger musicians". The duet reached No. 1 on the Billboard Hot Country Singles & Tracks chart in June 1998 and spawned an additional three Top 10 hits during that year: "Forever Love", "Wrong Night", and "One Honest Heart". In addition, If You See Him peaked within the Top 10 on both the Billboard 200 and Top Country Albums chart, reaching No. 8 and No. 2, respectively. In early 2008, McEntire partnered again with Brooks & Dunn for a re-recorded version of their single "Cowgirls Don't Cry". McEntire is featured in the video, but not on the version found on the album Cowboy Town. It became McEntire's fifty-sixth Top Ten country hit, breaking Dolly's record for the most Top Ten country hits for a solo female. In November 2008, McEntire announced that she would be departing from her label of twenty-five years and signing with the Valory Music Group, an imprint of Big Machine Records (coincidentally distributed by MCA and Mercury's parent, Universal Music Group). Under MCA, she had sold a total of sixty-seven million records worldwide and won two Grammys. The switch to Valory reunited McEntire with the label's president, Scott Borchetta, who had worked as senior vice president of promotion at MCA during most of the 1990s. McEntire later commented on her label switch, stating, "I am thrilled to be joining the Valory team. Scott and I worked together on some of the biggest singles of my career, and I am excited to renew our partnership." In November, 2008, MCA released a 50 Greatest Hits box set compilation album, containing three CDs, from 1984's "How Blue" to 2007's "Because of You". McEntire's thirty-fourth studio album, All the Women I Am, was released on November 9, 2010, under Valory Music Group/Starstruck Records. The album's lead single called "Turn On the Radio" was released on August 3, 2010, and the music video premiered on August 18, 2010. Upon its release, All the Women I Am received generally positive reviews from most music critics. At Metacritic, which assigns a normalized rating out of 100 to reviews from mainstream critics, the album received an average score of 72, based on 4 reviews, which indicates "generally favorable reviews". On November 10, 2010, McEntire appeared at the Country Music Association Awards performing her version of Beyoncé's "If I Were a Boy". On December 20, 2010, McEntire scored her 35th Billboard number-one single in the U.S. with "Turn On the Radio". The second single from All the Women I Am was a cover of Beyoncé's "If I Were a Boy", which McEntire took to No. 22. After it came "When Love Gets a Hold of You" at No. 40 and "Somebody's Chelsea" at No. 44. The latter was the only single that McEntire had co-written since "Only in My Mind" in 1985. McEntire later announced that she would be visiting 31 cities on her All the Women I Am Tour' late that year with The Band Perry, Steel Magnolia, and Edens Edge as opening acts on different stops of the tour. Dates for the tour were announced July 6, 2011. On March 1, 2011, the Country Music Association announced that McEntire would be inducted into the Country Music Hall of Fame. McEntire was unable to attend the announcement after her father had slipped into a coma following a stroke. McEntire was inducted into the Country Music Hall of Fame on May 22, 2011, at a Medallion Ceremony that took place at the Country Music Hall of Fame in Nashville, Tennessee. She was inducted by one of her musical idols, Dolly Parton. On October 21, 2014, it was announced that McEntire would be the inaugural signing for Big Machine's new imprint Nash Icon Music. She also disclosed that she was working on a new album, with 11 new songs. Her first single for the new label, "Going Out Like That," was announced December 16, 2014 and was released on January 6, 2015. It served as the lead-off single to Love Somebody, McEntire's twenty-seventh studio album, released on April 14, 2015. Love Somebody debuted at No. 1 on the Billboard Top Country Albums—her twelfth number-one album on the chart—and No. 3 on Billboard 200, selling 62,469 copies in the U.S. The album has sold 171,600 copies in the U.S. as of October 5, 2015. In 2016, McEntire was selected as one of 30 artists to perform on "Forever Country", a mash-up track of Take Me Home, Country Roads, On the Road Again and I Will Always Love You which celebrates 50 years of the CMA Awards. In 1990, she obtained her first film role playing Heather Gummer in the horror comedy Tremors, along with Kevin Bacon. The film told the story of a small group of people living in Nevada who were fighting subterranean worm-like creatures. After the film's release, McEntire developed a strong interest in acting and made it her second career. The following year, she starred along with Kenny Rogers and Burt Reynolds in the made-for-television movie, The Gambler Returns: The Luck of the Draw. In 1994, McEntire worked with director, Rob Reiner in the film, North, playing Ma Tex. The film obtained negative reviews, receiving only two and a half stars from Allmovie. In early 2001, McEntire expanded into theater, starring in the Broadway revival of Annie Get Your Gun. Playing Annie Oakley (whom she had previously portrayed in Buffalo Girls), McEntire's performance was critically acclaimed by several newspapers, including The New York Times, which commented, "Without qualification the best performance by an actress in a musical comedy this season." McEntire personally called the musical, "some of the hardest work I've ever done in my life". McEntire's sound has been influenced by the country music of Bob Wills, Merle Haggard, Dolly Parton, Barbara Mandrell, and Patsy Cline. In college, McEntire would attend local dances at the Oklahoma–Texas border so she could dance to Wills's music, commenting that, "it didn't get any better than dancing to Bob Wills music". She also explained Merle Haggard's influence on her career, stating "I had every album he ever put out", and would sing "every song he did", along with her brother, Pake and sister, Susie. In addition, her first major hit, "Sweet Dreams" was a remake of Patsy Cline's version of the song, according to McEntire herself. McEntire's music has been described to not only be built upon traditional country music, but also expand into the genres of Country pop, Mainstream pop, Soul, Adult Contemporary, and R&B. At times, her music has often been criticized for moving away from traditional country music. Many music critics have often called her music to be "melodramatic", "formulaic", and "bombastic", particularly after her 1988 album, Reba. Studio releases such as Sweet Sixteen, Rumor Has It, It's Your Call, and Starting Over have often been described by these terms. McEntire possesses a contralto vocal range and performs "vocal gymnastics" with her voice, a musical technique in which a singer twirls a note around, using their vibrato. McEntire has often credited Dolly Parton for influencing this trait, stating that she would always listen to Parton's records and find her style of vocal gymnastics, "so pretty". McEntire has often been regarded as one of country music's most influential female vocalists and most beloved entertainers. She has also been highly credited for remaining one of country's most popular female artists for nearly four decades, maintaining her success by continually incorporating contemporary musical sounds without changing her traditional vocal style. For many new artists, she has been credited as the inspiration to their careers in country music, including Faith Hill, Martina McBride, Trisha Yearwood, and LeAnn Rimes. She has also been credited as an inspiration to other performers such as Sara Evans, Kelly Clarkson, Lee Ann Womack, Terri Clark, Taylor Swift, and Carrie Underwood, The Net Music Countdown second-handedly reported, "That influence has manifested itself in many ways. As a role model, she's shown others how to handle fame with grace and good humor while never backing down from her values or goals. Just as importantly, she's shown others to refuse to accept limitations on what she can do or how much she can achieve." McEntire also explained to the online website, "Whatever I'm doing, I feel like I'm representing country music". "It's always been my main career, and it's where my loyalties lie. I feel like I'm waving the flag of country music wherever I go, and I couldn't be prouder to do it." Two of her siblings have also had careers in the music industry. Her brother, Pake, dabbled in the country music industry in the late 80s but returned to Oklahoma after a brief stint. He owns and operates a 1,000 acre ranch near Colgate, Oklahoma and continues to rodeo. Her sister, Susie McEntire, is a successful Christian music singer who travels the country with her husband speaking and performing. She also has an older sister, Alice Foran, a retired social worker, who resides in Lane, OK. Her niece, Calamity McEntire, is an assistant basketball coach at the University of Arizona. In 1976, McEntire married national steer wrestling champion and rancher Charlie Battles who was ten years older than her and had two teenage sons, Lance and Coty. Together, the couple owned a ranch in Oklahoma and Battles also managed her career. In 1987, McEntire divorced Battles and moved to Nashville, Tennessee. She later commented to Bob Allen of Country Music about their separation, saying, "I had to pack everything in one day and leave. I was totally starting over." McEntire later claimed that she wanted to focus more on her music career, while Battles felt she had peaked and insisted that she remain at home, helping to take care of the ranch and quit her music career. McEntire stated, "I wasn't the little girl anymore, taking orders, and doing what he said. I knew my career had not peaked and I wasn't going to walk away from it when I was rolling in awards, charting number one hits, and touring and selling out concerts. I had worked so hard to get my career to that level of success and I meant I wasn't giving it up yet. A lot of people said I put my career before my marriage, and maybe I did, I don't know. But we had grown apart so much on a personal level and wanted two different things out of life. There were personal issues other than my career coming between us and when you can't respect somebody anymore, you can't have a marriage, so I walked away." Battles had a major stroke in 2006 and became totally disabled as a result. He died on April 21, 2013. After the divorce from Battles, McEntire's career started to gain significant and sustained momentum. In 1989, McEntire married her manager and former steel guitar player, Narvel Blackstock. The couple wed in a private ceremony on a boat in Lake Tahoe. Together, the pair took over all aspects of McEntire's career, forming Starstruck Entertainment, which was originally designed to help manage her career. From her second marriage, McEntire inherited three stepchildren - Chassidy, Shawna, and Brandon - and then gave birth to a son, Shelby Steven McEntire Blackstock, in February 1990. On August 3, 2015, it was announced in a joint statement on McEntire's website that she and Blackstock had been separated for a few months after twenty-six years of marriage. McEntire announced in December 2015 that their divorce was final on October 28, 2015. Despite the divorce, McEntire remains very close to her three stepchildren as well as the Blackstock family. Her step kids have six children between them whom she adores and considers them her grandchildren. In fact, McEntire's song "Somebody's Chelsea" was written about her granddaughter. McEntire's stepson Brandon Blackstock is married to McEntire's friend and fellow singer Kelly Clarkson, who is also managed by McEntire's ex-husband. Speaking about their impending marriage in 2013, McEntire stated that she was, "thrilled to death, thrilled to death. To have my buddy as my daughter-in-law, I mean, who could ask for more?" McEntire holds the record for the most Academy of Country Music Top Female Vocalist Awards (seven), and American Music Awards for Favorite Country Female Artist (twelve). She also holds the distinction of being the first to win the Country Music Association's Female Vocalist of the Year Award four times consecutively. Martina McBride won Female Vocalist four times, although not consecutively. In 2013, Miranda Lambert tied McEntire to win Female Vocalist four years in a row. McEntire is also a rare musical artist to achieve solo number-ones across four decades (1980s, 1990s, 2000s, 2010s). She holds the record for most CMA Award nominations for a female artist, with 49. 2010 Better with You Lorraine Ashley Episode: "Better With Flirting"
2011 Working Class Renee Episode: "Sugar Mama"
2016 Last Man Standing Billie Cassidy Episode: "Outdoor Woman"
↑ "Reba McEntire Biography". Retrieved September 11, 2011. ↑ "Reba McEntire". EW.com. Archived from the original on 2007-03-26. Retrieved 2007-04-17. ↑ Cronick, Scott (2012-10-09). "Review: Reba McEntire spans 36-year country career, including new songs, in performance at Revel". The Press of Atlantic City. Retrieved 2013-04-09. 1 2 3 4 5 6 7 8 9 10 11 12 13 14 15 16 17 18 Rulmann, William. "Reba McEntire – Biography". AllMusic. Retrieved 2009-08-23. ↑ Dukes, Billy (October 24, 2014). "Reba McEntire's Dad Dies". Taste of Country. Retrieved October 25, 2014. ↑ "Reba McEntire". Who Do You Think You Are?. Season 3. Episode 4. 2012-03-02. NBC. 1 2 3 4 5 6 7 8 9 10 Wolff, Kurt. "Ch. 12 – Wild and Blue: Traditionalism Makes a Comeback". In Orla Duane. Country Music: The Rough Guide. London, England: Rough Guides Ltd. ISBN 1-85828-534-8. 1 2 3 4 5 6 7 8 9 10 11 12 13 14 15 16 17 18 19 20 Whitburn, Joel (2008). Hot Country Songs 1944 to 2008. Record Research, Inc. pp. 270–271. ISBN 0-89820-177-2. ↑ Adams, Greg. "Reba McEntire > Overview". allmusic. Retrieved 2009-08-24. 1 2 "Reba McEntire Bio – AskMen.com". Ask Men. Retrieved 2009-08-24. ↑ Ruhlmann, William. "Heart to Heart > Overview". allmusic. Retrieved 2009-08-24. 1 2 Ruhlmann, William. "My Kind of Country > Overview". allmusic. Retrieved 2009-08-24. ↑ Ruhlmann, William. "Have I Got a Deal for You > Overview". allmusic. Retrieved 2009-08-24. ↑ "Opry Member: Reba McEntire". opry.com. Archived from the original on May 18, 2008. Retrieved 2009-08-24. ↑ Ruhlmann, William. "What Am I Gonna Do About You > Overview". allmusic. Retrieved 2009-08-24. ↑ Bush, John. "Merry Christmas to You > Overview". allmusic. Retrieved 2009-08-25. ↑ Ruhlmann, William. "Reba > Overview". allmusic. Retrieved 2009-08-25. ↑ Ruhlmann, William. "Sweet Sixteen > Overview". allmusic. Retrieved 2009-08-25. ↑ Ruhlmann, William. "Rumor Has It > Overview". allmusic. Retrieved 2009-08-25. ↑ Granberry, Michael (1991-03-17). "8 Country Band Members Die in S.D. Air Crash". Los Angeles Times. Retrieved 2009-08-25. 1 2 Nash, Alanna (1991-10-11). "For My Broken Heart – Music Review". Entertainment Weekly. Retrieved 2009-08-25. ↑ "For My Broken Heart > Album charts". allmusic. Retrieved 2009-08-25. ↑ "It's Your Call > album charts". allmusic. Retrieved 2009-08-25. ↑ It's Your Call (CD booklet). Reba McEntire. MCA Records. 1992. MCAD-10673. 1 2 "It's Your Call > Singles chart positions". allmusic. Retrieved 2009-08-25. ↑ Nash, Alanna (1992-12-18). "It's Your Call". Entertainment Weekly. Retrieved 2009-08-25. ↑ Farley, Christopher John (1993-01-25). "Broken Heartland". Time magazine. Retrieved 2009-08-25. ↑ "RIAA Gold & Platinum – Reba McEntire albums". Recording Industry Association of America. Retrieved 2009-08-25. ↑ "Greatest Hits Volume Two > Billboard album positions". allmusic. Retrieved 2009-08-25. ↑ Ruhlmann, William. "Greatest Hits Volume Two > Overview". allmusic. Retrieved 2009-08-25. ↑ "RIAA Gold & Platinum – Greatest Hits, Volume II". Recording Industry Association of America. Retrieved 2009-08-25. ↑ "Read My Mind > Billboard singles chart positions". allmusic. Retrieved 2009-08-26. ↑ "Read My Mind > Billboard album chart positions". allmusic. Retrieved 2009-08-26. ↑ Dillon, Charlotte. "Read My Mind > Overview". allmusic. Retrieved 2009-08-26. ↑ Nash, Alanna (1994-04-29). "Read My Mind". Entertainment Weekly. Retrieved 2009-08-26. ↑ Morris, Edward. "Ten Years Later, "John" Remains Country's Prime Comment on AIDS". CMT.com. Archived from the original on 2007-10-06. Retrieved 2007-08-11. ↑ "RIAA Gold & Platinum – Read My Mind". Recording Industry Association of America. Retrieved 2009-08-26. ↑ Browne, David (1995-10-27). "Starting Over". Entertainment Weekly. Retrieved 2009-08-26. ↑ Erlewine, Stephen Thomas. "Starting Over > Overview". allmusic. Retrieved 2009-08-26. ↑ "RIAA Gold & Platinum – Starting Over". Recording Industry Association of America. Retrieved 2009-08-26. ↑ "Billboard chart positions for > singles from Starting Over". Allmusic. Retrieved 6 July 2010. 1 2 3 4 5 Coyne, Kevin J. "100 Greatest Women, No. 6: Reba McEntire". country universe. Retrieved 2009-08-26. ↑ Owens, Thom. "What If It's You > Overview". allmusic. Retrieved 2009-08-26. ↑ "What If It's You > Charts & awards". allmusic. Retrieved 2009-08-26. ↑ "RIAA Gold & Platinum". Recording Industry Association of America. Retrieved 2009-08-26. ↑ Wix, Kimmy (1998-06-05). "Reba and Brooks & Dunn: Good Things Come In Threes". Country Music Television. Retrieved 2008-03-03. ↑ Owens, Thom. "If You See Her > Review". allmusic. Retrieved 2009-08-26. ↑ "Billboard chart positions for > If You See Him". Allmusic. Retrieved 6 July 2010. ↑ Nash, Alanna. "So Good Together – Music Review". Entertainment Weekly. Retrieved 2009-08-26. ↑ Morse, Steve (2004-01-02). "Reba McEntire, Room to Breathe, MCA Nashville". The Boston Globe. Retrieved 2009-08-26. ↑ MacIntosh, Dan. "2003 MCA Nashville – Room to Breathe". Country Standard Time. Retrieved 2009-08-26. ↑ "Room to Breathe (Charts)". a.charts.us. Retrieved 2009-08-27. ↑ Hayes, John. "Country star balances busy life on stage and screen". Fancy Reba. Retrieved 2009-08-27. ↑ MacIntosh, Dan. 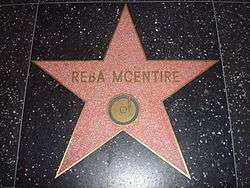 "Reba McEntire 2005 MCA – Reba No. 1's". Country Standard Time. Retrieved 2009-08-27. ↑ "CMA Awards Database Reba McEntire". CMA Awards.com. Retrieved 2009-08-27. ↑ Hailsop, Neil. "Reba Set for release of Duets". Retrieved 2009-08-27. ↑ Hailsop, Neil. "Reba Posts 55th Top Ten Hit". Fantasy Music League. Retrieved 2009-08-27. ↑ Cooper, Lana. "PopMatters < Reba Duets". PopMatters. Retrieved 2009-08-27. ↑ Morris, Edward (2007-09-29). "Reba Rules Album Charts". Country Music Television. Retrieved 2009-08-27. ↑ "Reba McEntire, Kelly Clarkson tour together". Country Standard Time. 2007-11-15. Retrieved 2009-08-27. ↑ "RIAA Gold & Platinum – Duets". RIAA. Retrieved 2009-08-27. ↑ Bronson, Fred (2009-01-22). "Billboard Chart Beat". Billboard. Archived from the original on July 25, 2013. Retrieved 2009-01-25. ↑ "Valory Music label lands Reba McEntire". The Nashville Business Journal. 2008-11-11. Retrieved 2009-08-27. ↑ Betts, Stephen L. (2008-11-11). "Reba McEntire Leaves MCA, Signs with Valory Music Co". The Boot. Retrieved 2009-08-27. ↑ Evans Price, Deborah. "Single Review, Strange". Billboard. Archived from the original on 2009-04-17. Retrieved 2009-04-13. ↑ "SUPERSTAR REBA'S "STRANGE" MAKES HIGHEST SOLO CHART DEBUT OF CAREER". PR Newswire. 2009-04-13. Retrieved 2009-04-13. ↑ "With new album release approaching, Reba McEntire will be everywhere". Examiner.com/Country Blips. Retrieved 2009-08-27. ↑ Skates, Sarah (2008-08-26). "Reba's Record Setting Album Enters At No. 1". Music Row. Retrieved 2009-08-27. ↑ "Reba McEntire releasing "Consider Me Gone"". Country Music Stop. 2008-07-28. Retrieved 2009-08-27. ↑ Darden, Beville. "Reba's 'Gone' Straight to the Top". The Boot. Retrieved 29 December 2009. ↑ Moore, Shannon (2010-01-05). "Country Star Reba McEntire's New Single "Consider Me Gone" Spends Third Week at No. 1". AHN. 2010-01-08. Retrieved 8 January 2010. ↑ "Reba". The Valory Music Co. Archived from the original on December 18, 2010. Retrieved 2010-08-19. ↑ "Reba Album Due Nov. 9". MusicRow. 2010-07-19. Retrieved 2010-08-19. ↑ "Niet compatibele browser". Facebook.com. Retrieved 2010-08-19. ↑ "Reba McEntire". TVGuide.com. 2010-11-02. ↑ "Reba McEntire Scores 35th Number One". TVGuide.com. 2010-12-20. ↑ "Reba talks about her Dillard's line and her new single". Great American Country. 26 July 2011. Retrieved 31 August 2011. ↑ Duvall, Erin (6 July 2011). "Reba Announces 'All the Women I Am' Tour Dates". The Boot. Aol, Inc. Retrieved 9 July 2011. 1 2 "Reba McEntire among Country Hall of Fame inductees". Reuters. 2011-01-03. Retrieved 2015-08-29. ↑ "Reba McEntire Becomes Nash Icon Music Label's Inaugural Signing". Billboard.com. 21 October 2014. Retrieved 17 November 2014. ↑ "KTIC Radio". Kticradio.com. 2014-12-16. Retrieved 2015-04-15. ↑ "New Album "Love Somebody" Available April 14". Reba.com. 2015-02-13. Retrieved 2015-04-15. ↑ Brandy McDonnell (April 22, 2015). "Reba McEntire's 'Love Somebody' debuts at No. 1 on Billboard country album chart". NewsOK. ↑ Matt Bjorke (October 5, 2015). "Country Albums Chart Report For October 5, 2015". Roughstock. ↑ "30 Country Music Stars Join Forces for Historic CMA Music Video, 'Forever Country'". Abcnews.go.com. Retrieved 2016-09-17. 1 2 3 Opry. "Reba McEntire". Retrieved 14 March 2014. ↑ Thompson, Gayle. "28 Year Ago: Reba McEntire joins the Grand Ole Opry". Retrieved 14 March 2014. ↑ Eder, Bruce. "Tremors". Retrieved 2009-08-27. 1 2 Albertson, Cammila. "Reba McEntire > Biography [Allmovie]". Allmovie. Retrieved 2009-08-27. ↑ Armstrong, Derek. "North > Review". allmovie. Retrieved 2009-08-27. ↑ McCallion, Bernadette. "Buffalo Girls". Allmovie. Retrieved 2009-08-27. ↑ "Titanic Tidbits: Little known facts about the movie and the actors". Angel Fire. Retrieved 2009-08-27. ↑ "Reba McEntire Stars in Forever Love". epinions. Archived from the original on June 29, 2011. Retrieved 6 July 2010. ↑ "Reba McEntire biography (originally sourced from about.com)". absoulutley.net. Retrieved 2009-08-27. 1 2 Interview with Reba McEntire for CMT Inside Fame on Country Music Television. Retrieved August 26, 2009. ↑ Gans, Andrew. "Reba McEntire-Brian Stokes Mitchell South Pacific To Be Taped for TV". Playbill.com. Retrieved 9 July 2010. ↑ "Reba: TV.com". TV.com. Retrieved 2009-08-27. ↑ "Reba: Is the CW Sitcom Cancelled for Sure?". TV series Finale.com. 2007-01-24. Retrieved 2009-08-27. 1 2 Wallenstein, Andrew (2011-09-09). "ABC buys Reba McEntire comedy". Variety. ↑ "Reba McEntire Planning Pilot for ABC Sitcom, Malibu Country". CMT.com. 2011-09-09. ↑ "Reba McEntire Series 'Malibu Country' Picked Up by ABC". Tasteofcountry.com. 2012-05-12. Retrieved 2012-12-16. ↑ Seidman, Robert (November 28, 2012). "'Last Man Standing' and 'Malibu Country' Get 5 More Episodes Each". TV by the Numbers. Retrieved November 29, 2012. 1 2 3 4 Nash, Alanna. "Ch. 11 – Tell Me 'Bout the Good Old Days". Will the Circle Be Unbroken: Country Music in America. New York, USA: DK Publishing, Inc. p. 316. ISBN 0-7566-2353-7. ↑ ""San Antionio Rose" lyrics (including citing McEntire's musical influences, beneath lyrics)". Kovideo.net. Retrieved 2009-08-27. ↑ Brunson, Rick (2007-09-09). "Larger than life Reba breaks in UCF Arena, both get high marks". Orlando Sentinel. Retrieved 2009-08-27. ↑ Morrow, Megan. "Album review: Reba (1988)". My Kind of Country. Retrieved 2009-08-27. ↑ "Reba McEntire (originally sourced from her official website)". The Net Music Countdown. Retrieved 2009-08-27. ↑ Hay, Carla. "The Many Sides of Reba McEntire". Lifetime.com. Retrieved 2009-09-01. ↑ Saad, Nardine. "Reba McEntire splits from husband-manager Narvel Blackstock". Los Angeles Times. ↑ Karen Mizoguchi (December 19, 2015). "Reba McEntire Confirms Date of Divorce From Ex-Husband Narvel Blackstock on Facebook". People. Retrieved December 19, 2015. ↑ Webber, Stephanie (October 21, 2013). "Kelly Clarkson Marries Fiance Brandon Blackstock In Tennessee – All the Details!". Us Weekly. Retrieved October 21, 2013. ↑ Nessif, Bruna (February 12, 2013). "Reba McEntire "Thrilled to Death" to Have Kelly Clarkson as Daughter-in-Law". E!. Retrieved October 21, 2013. ↑ Universal Pictures Home Entertainment (December 17, 2015). "From Universal Pictures Home Entertainment: The Land Before Time: Journey of the Brave". PR Newswire. Retrieved February 1, 2016. Wikimedia Commons has media related to Reba McEntire.